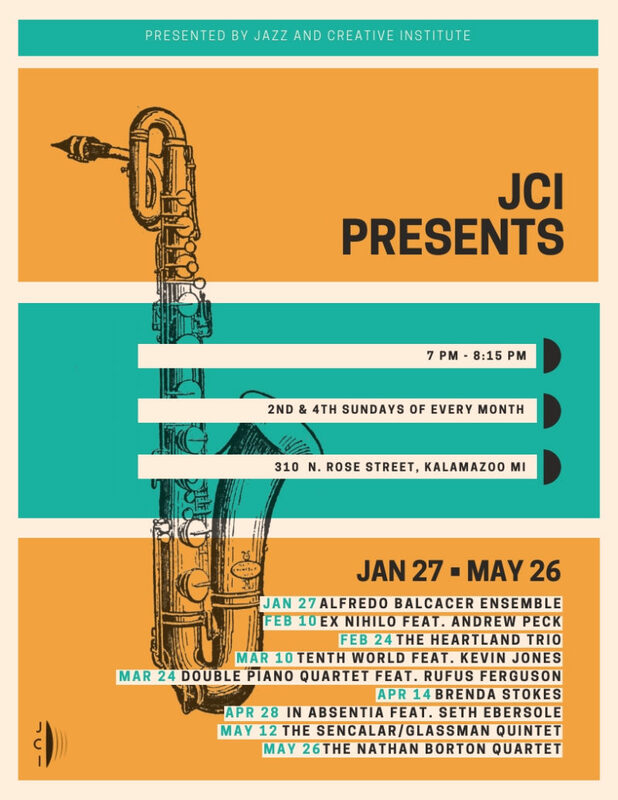 The Jazz and Creative Institute is proud to present an intimate performance series featuring both emerging and established artists, titled JCI Presents. Our listening room environment provides attentive audiences for visiting/touring artists and the Kalamazoo area's own thriving jazz artists. Performances are the 2nd and 4th Sundays of each month at 7pm. JCI Presents is a free concert series presented to the community with suggested donations. Founded by bassist Hannah Marks in 2017, Heartland Trio consists of Hannah Marks on double bass and vocals, Barclay Moffitt on tenor saxophone, and Rocky Martin on drums. The band draws from Marks’ musical upbringing in folk and spirituals, while grounded in the group’s improvisational and groove background of jazz and rock. Along with their original compositions, Heartland Trio also uses jazz standards, rock songs, and traditional folk tunes as vehicles for expression. The trio's sound reflects their desire to create with a gritty and spontaneous garage band mentality while exploring beyond the boundaries of the traditional roles of their instruments in a jazz setting.